Is it melodramatic to say CrossFit saved my life? Christmas Day, 2009, I stepped on the scale and weighed 185 lbs. That’s not too bad, except I’m 5’4”! So the first step in my weight loss program was to throw away the scale. Problem solved! A few months later I had a medical checkup and found I had high blood pressure, high cholesterol and high triglycerides. No surprise, since my biggest physical activity was pondering which fast-food restaurant I would eat lunch at that day. As I drove home (after stopping for chili dogs at Sonic), I realized I was only 8 years younger than my Dad when he had quadruple bypass heart surgery. It was one of those “Holy @#$%” moments. I was lamenting my woes to a friend who recommended this thing she was doing called CrossFit. For years she had been doing typical Air Force PT (elliptical machine or stationary bike), but started CrossFit when she was deployed to Iraq. 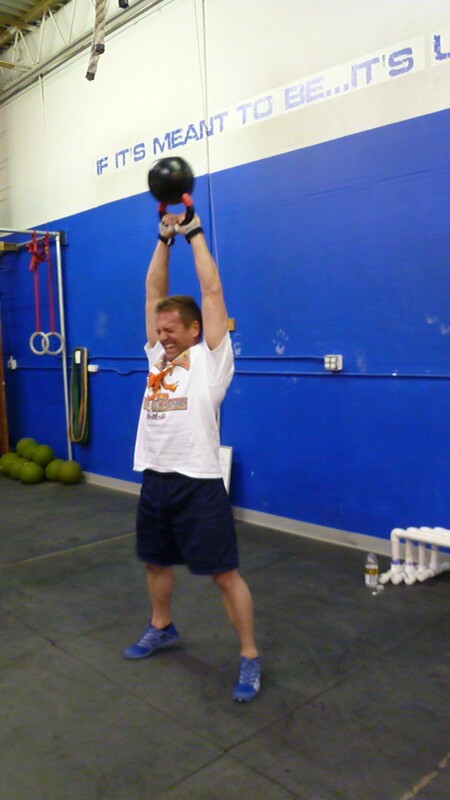 I did a little research, found a gym I liked and started CrossFit May 17th, 2011. My first WOD (Workout Of the Day) was 3 rounds of front squats, sit-ups and handstand walk. I completed one partial round in 6:47 and stumbled out of the gym, blurry eyed, gasping for air, wondering what the heck had I signed up for. I couldn’t last 7 minutes? It wasn’t always this hard, was it? As I left that afternoon, Coach Shane Rosselle said something that I’ve carried with me since: Don’t let what you can’t do, prevent you from doing what you can do. With that in mind, I vowed to return the next day. Since that day, I’ve lost over 45 pounds, reversed my cholesterol numbers to healthy levels and lowered my blood pressure to around 115/65. I’ve stopped taking medication for my cholesterol and high blood pressure. CrossFit has shown me a path to a long healthy life with my wife Felicia and kids Brittany, Morgan and Dylan, through constantly varied functional movements. I’ve attended the CrossFit Movement & Mobility Seminar, obtained CrossFit Strongman and Level 1 CrossFit Coach certifications, and competed in the 2012 CrossFit Open. If you’re looking for a fitness challenge and lifestyle change that will help you to be healthier, happier and achieve better fitness, join us at Fight Tonight CrossFit. Remember what a smart guy told me once: Don’t let what you can’t do, prevent you from doing what you can do. Jim I did not see Jason as an option for the judge, so I put you in. I messaged Scott in FB, but wanted to try this avenue to get word to you to validate. It appears that Crossfit does not care where you were judged, just that a judge must have completed the judges course.